Presley was born in Tupelo, Mississippi, on January 8, 1935, and grew up surrounded by gospel music of the Pentecostal church. In 1948 the family moved to Memphis, where he was exposed to blues and jazz on Beale Street. After graduating from high school in 1953, an 18-year-old Presley visited the Memphis Recording Service - also the home of Sun Records - to record his voice. Owner/producer Sam Phillips was struck by the plaintive emotion in Presley’s vocals and subsequently teamed him with guitarist Scotty Moore and bassist Bill Black. In July 1954 the trio worked up “That’s All Right” and “Blue Moon of Kentucky” - blues and country songs, respectively - in a crackling, uptempo style that stands as the blueprint for rock and roll. Presley’s career momentum was interrupted by a two-year Army stint in Germany, where he met his future wife, Priscilla. For much of the Sixties, he occupied himself with movie-making and soundtrack-recording. His albums of sacred songs, such as How Great Thou Art, stand out from this otherwise fallow period. Presley’s standing as a rock and roller was rekindled with an electrifying TV special, simply titled Elvis and broadcast on December 3, 1968. He followed this mid-career renaissance with some of the most mature and satisfying work of his career. Recording in Memphis, he cut such classic tracks as “In the Ghetto, “Suspicious Minds” and “Kentucky Rain” with the soulful, down-home musicians at American Studio. If the Fifties were devoted to rock and roll and the Sixties to movies, the Seventies represent the performing chapter in Presley’s career. He toured constantly, performing to capacity crowds around the country until his death. Presley died of a heart attack at Graceland, his Memphis mansion, on August 16, 1977. He was 42 years old. How big was Elvis? January 8, 1935: Elvis Aron Presley is born to Gladys and Vernon Presley in a two-room cabin on North Saltillo Road in East Tupelo, Mississippi. Summer 1953: Elvis Presley stops at Memphis Recording Service to record two songs, “My Happiness” and “That’s When Your Heartaches Begin,” as a birthday present for his mother. Phillips notes that Presley has a good feel for ballads and should be invited back. January 4, 1954: A young Elvis Presley visits the Memphis Recording Service to record “Casual Love Affair” and “I’ll Never Stand in Your Way” and meets Sun Records owner Sam Phillips. June 27, 1954: After several fruitless recording sessions, Sam Phillips pairs Elvis Presley with guitarist Scotty Moore and bass player Bill Black. He hopes the singer might find his voice by rehearsing with other musicians cut from the same country, pop, gospel and R&B cloth. July 19, 1954: Sun releases “That’s All Right” and “Blue Moon of Kentucky” by Elvis Presley, backed by guitarist Scotty Moore and bassist Bill Black. July 20, 1954: Elvis Presley makes his first public appearance, performing on a flatbed truck in Memphis. This inaugurates a period of wildly performed and riotously received concerts that will be interrupted only by Presley’s induction into the U.S. Army. August 15, 1955: Elvis Presley signs a management contract with “Colonel” Tom Parker, whose other clients included country-music stars Eddy Arnold and Hank Snow. The relationship with Parker will continue till Presley’s death. November 1, 1955: Despite Presley’s growing popularity, his five Sun singles fail to make a dent on the national charts. Phillips sells his contract to RCA Records for $35,000. November 20, 1955: Elvis Presley’s contract with Sun Records, including all previously released and recorded material, is sold to the New York-based RCA label for $35,000. January 27, 1956: Elvis Presley’s debut single for RCA, “Heartbreak Hotel,” is released. The first of Presley’s 17 Number One hits, it holds down the top spot for eight weeks. “Heartbreak Hotel” establishes Elvis Presley and rock and roll itself as national phenomena. January 28, 1956: Elvis Presley makes his first appearance on network TV as a guest on Stage Show, hosted by jazz bandleaders Tommy and Jimmy Dorsey. Throughout 1956, Presley’s biggest year, he will also appear on The Milton Berle Show, The Steve Allen Show and The Ed Sullivan Show. April 15, 1956: Heartbreak Hotel (Elvis Presley) was a hit. July 22, 1956: I Want You, I Need You, I Love You (Elvis Presley) was a hit. August 4, 1956: What many consider to be one of rock’s greatest double-sided singles, “Don’t Be Cruel” and “Hound Dog,” is released. Both sides will share the top spot for 11 weeks. August 12, 1956: Hound Dog/Don’t Be Cruel (Elvis Presley) was a hit. October 28, 1956: Love Me Tender (Elvis Presley) was a hit. November 15, 1956: The film ‘Love Me Tender,’ which features Elvis Presley in the first of 31 Hollywood movie roles, premieres at the New York Paramount. Two months earlier, on September 9th, he performed the title song on the Ed Sullivan Show to a record viewing audience estimated at 54 million. December 4, 1956: Four legendary past and present Sun Records recording artists—Elvis Presley, Jerry Lee Lewis, Carl Perkins and Johnny Cash—gather at Sun for an informal jam session. Later dubbed the Million Dollar Quartet, the stars (sans Cash, who stays only briefly) perform gospel standards and recent hits in relaxed, impromptu fashion. December 4, 1956: The “Million Dollar Quartet"—Presley, Perkins, Cash and Jerry Lee Lewis—records old gospel, country and pop songs at an impromptu session. The recordings aren’t officially released until the mid-Eighties. 1957: Leiber & Stoller are summoned to New York by Elvis’s Brill Building music publisher to write songs for the movie ‘Jailhouse Rock.’ The title song soon reaches #1. January 6, 1957: Elvis Presley sings five songs in his final performance on the Ed Sullivan Show. January 8, 1957: Elvis Presley passes the pre-induction exam for the Army. February 3, 1957: Too Much (Elvis Presley) was a hit. April 7, 1957: All Shook Up (Elvis Presley) was a hit. July 2, 1957: (Let Me Be Your) Teddy Bear (Elvis Presley) was a hit. September 1, 1957: Jimi Hendrix goes to see Elvis Presley perform at Sicks Stadium. October 15, 1957: Jailhouse Rock (Elvis Presley) was a hit. December 19, 1957: Elvis Presley is served with his draft notice while home at Graceland for the Christmas holidays. He is sworn in as a private in the U.S. Army on March 24, 1958, and later sent to basic training in Fort Hood, Texas. Shipped to Germany, he will serve in Company D, 32nd Tank Battalion, 3rd Armor Corps, from October 1, 1958, to March 1, 1960. February 4, 1958: Don’t (Elvis Presley) was a hit. July 15, 1958: Hard Headed Woman (Elvis Presley) was a hit. August 4, 1959: A Big Hunk O’ Love (Elvis Presley) was a hit. April 19, 1960: Stuck On You (Elvis Presley) was a hit. August 9, 1960: It’s Now Or Never (Elvis Presley) was a hit. November 22, 1960: Are You Lonesome Tonight? (Elvis Presley) was a hit. March 14, 1961: Surrender (Elvis Presley) was a hit. December 16, 1961: The soundtrack to Blue Hawaii reaches #1 on the album charts, where it will remain for 20 weeks. With sales of 2 million, it is Elvis Presley’s best-selling album to date. April 15, 1962: Good Luck Charm (Elvis Presley) was a hit. July 26, 1965: Elvis Presley’s version of the Orioles’ “Crying in the Chapel” peaks at #3 on the pop chart. May 1, 1967: Elvis Presley marries Priscilla Beaulieu, who he met eight and a half years earlier during his tour of duty in Germany, at the Aladdin Hotel in Las Vegas. Their daughter, Lisa Marie Presley, is born exactly nine months later, on February 1, 1968. December 3, 1968: NBC airs “Elvis,” a television special that revitalizes Elvis’ career as a rock and roll performer. December 8, 1968: The hour-long special Elvis, sponsored by Singer Sewing Machines, airs on NBC-TV. Clad in black leather, Elvis successfully pulls off the greatest comeback in rock and roll history. After his decade-long stint as a movie star, he re-establishes himself as a musical performer and cultural totem on this electrifying, widely viewed special. January 13, 1969: Presley enters American Sound Studio in Memphis, where he will cut some of the finest recordings of his career, including the hits “In the Ghetto” and “Suspicious Minds.” It is the first time he’s recorded in his hometown since 1956. July 31, 1969: Elvis Presley performs his first live concert since March 25, 1961, opening a four-week engagement at the 1,500-capacity Showroom at the International Hotel in Las Vegas. The remaining eight years of Presley’s life will largely be devoted to live performances, either on the road or at the International Hotel. 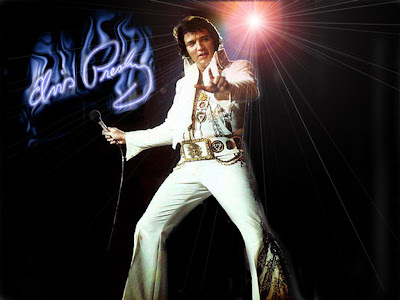 October 26, 1969: Suspicious Minds (Elvis Presley) was a hit. 1969: Elvis Presley returns to the road. His guitarist and bandleader is James Burton, who will remain with Presley until his death in 1977. January 9, 1971: Elvis Presley is named one of 10 Outstanding Young Men of the Year by the U.S. Jaycees. October 9, 1973: Elvis and Priscilla Presley divorce in Santa Monica, California. June 26, 1977: Elvis Presley delivers his last live performance, at Market Square Arena in Indianapolis, Indiana. July 16, 1977: The last of 105 singles by Elvis Presley to reach the Top Forty in his lifetime, “Way Down,” enters Billboard’s Top Pop Singles chart, peaking at #18. January 23, 1986: Elvis Presley is inducted in the Rock and Roll Hall of Fame at the first induction dinner. Julian and Sean Lennon are his presenters.